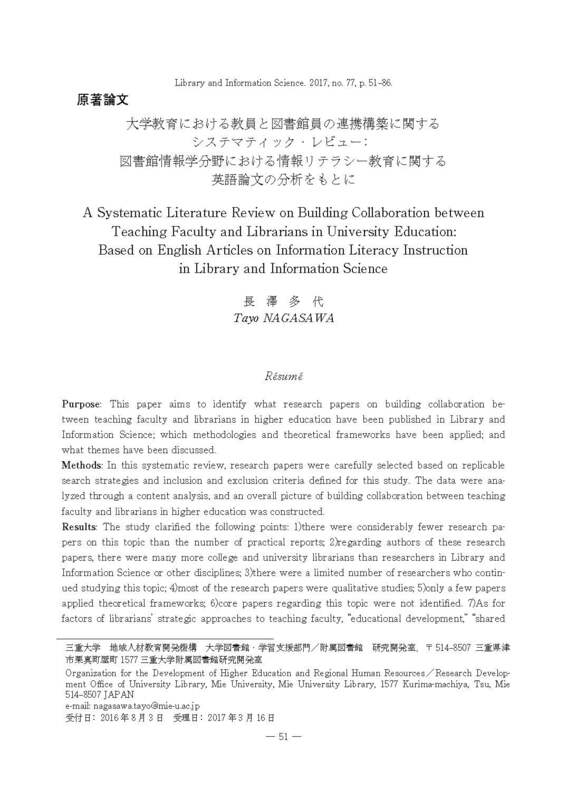 Purpose : This paper aims to identify what research papers on building collaboration between teaching faculty and librarians in higher education have been published in Library and Information Science ; which methodologies and theoretical frameworks have been applied ; and what themes have been discussed. Methods : In this systematic review, research papers were carefully selected based on replicable search strategies and inclusion and exclusion criteria defined for this study. The data were analyzed through a content analysis, and an overall picture of building collaboration between teaching faculty and librarians in higher education was constructed. Results : The study clarified the following points : 1) there were considerably fewer research papers on this topic than the number of practical reports ; 2) regarding authors of these research papers, there were many more college and university librarians than researchers in Library and Information Science or other disciplines ; 3) there were a limited number of researchers who continued studying this topic ; 4) most of the research papers were qualitative studies ; 5) only a few papers applied theoretical frameworks ; 6) core papers regarding this topic were not identified. 7) As for factors of librarians' strategic approaches to teaching faculty, "educational development," "shared goals and means," "building interpersonal relationships" and "working with other campus units" were identified, and as factors of the intervening conditions in the library, institutional and social contexts, "librarians' sense of rivalry with teaching faculty," "library's competence in collaboration," "accrediting agencies," "teaching faculty's attitudes towards libraries/librarians" and "campus hierarchy" were identified.